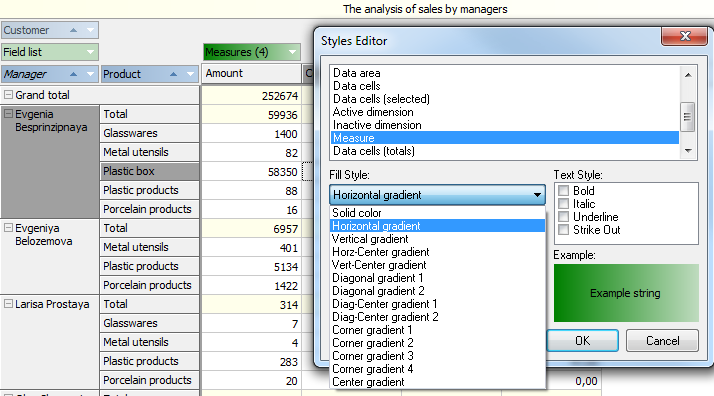 FastCube VCL 2 — is a tool for effective data analysis - Fast Reports Inc.
FastCube is a set of OLAP Desktop components. It supports Delphi 7, 2005, 2006/Turbo, 2007, 2009, XE, XE2, 2007, 2009, XE2, XE3, XE4, XE5, CodeGear RAD Studio 2009, Embarcadero RAD Studio 10.2 Tokyo and Lazarus. Compare editions of FastCube and choose the one for you! 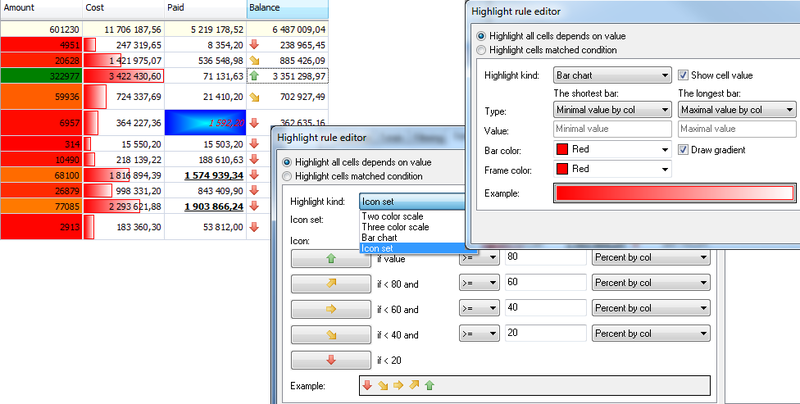 This screenshot shows that the cube grid has a title zone and active row marker and also supports resizing and cell selection for clipboard operations. This screenshot shows the improved appearance of the grid. Note that dropdowns are now consistent with other Windows controls. It is now possible to use a variety of gradient fills, as well as solid fills, for various parts of the grid. It is now possible to set up a dimension having a single value, if required. This screenshot shows how it appears in the grid. Or you can expand the group itself using the new “tree” button. Totals have many new features. 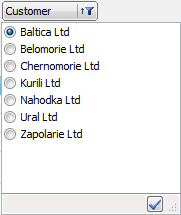 This screenshot shows some of them. The grid can now represent axes in a more compact form, as in this screenshot. Data highlighting has been significantly improved. It is now possible to highlight any cell dependent on its value, in addition to the existing conditional highlighting of cells (which itself has also been improved). 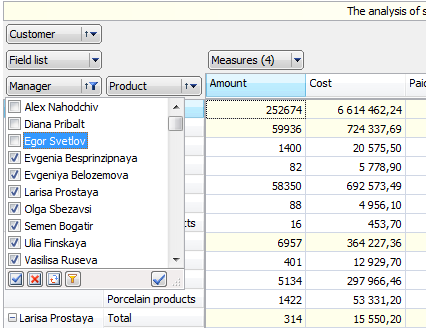 FastCube2 grid has a status panel which shows aggregates for a selected region. Although FastCube2 uses the same scripting engine as FastCube1 we have been able to improve its use in several ways. Whereas FastCube1 restricted the script space to individual calculated measures, so preventing the sharing of code with other measures, FastCube2 now has a script space common to all calculated measures, thus making it possible to share some code between them. FastCube2 comes with built-in support for exporting both slice and cube data to these data formats: XLS, HTML, DBF (cube data only), ODT and XML. - Custom split: a custom field can be created, based on any other field, and can be loaded in the code, using values from the base field. There is a new component, similar to the FastReport user dataset, which allows data loading from sources other than TDataSet. Field descriptions need to be written and also handlers for traversing the data store and retrieving the data. 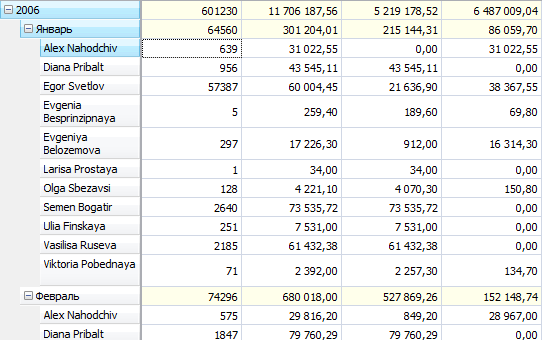 If a data table stores numerical data in a string field it is only required to specify the result type and the data loader will automatically convert values during the load process. For complex data transformations it is possible to create a user field which is evaluated during the load process. The evaluation can be performed using an embedded script or by means of an event handler. 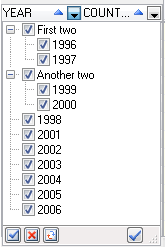 FastCube2 allows the loading of additional data to already opened cubes. FastCube2 has a new standalone component which allows a single data cube to simultaneously analyse data using different criteria provided by independent filters. Other features that will be implemented in future FastCube2.x versions include: hierarchical dimensions, top-N, vertical text output, export to more data formats … and more.